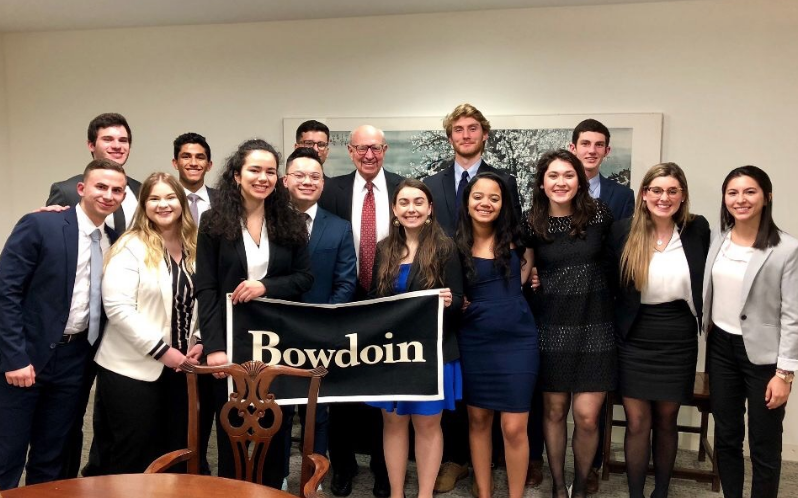 Twelve sophomores, along with two seniors acting as trip leaders, headed to Washington DC over the spring break on the second Bowdoin Public Service Initiative. The program, which is organized by the McKeen Center, is designed to provide students with the opportunity to delve into topics around government and public policy work in Washington, DC. Students get the opportunity to explore government and public service work through a seven-week seminar series, culminating in the week-long immersion trip to the capital. They meet Bowdoin alumni and others working in a wide variety of public service and support roles, including the federal government, Congress, the Judiciary, think thanks, and the nonprofit sector. This year’s excursion included two alumni who worked in the higher levels of public service for many years: former Secretary of Defense William Cohen ’62, who is head of The Cohen Group, a strategic advisory firm; and Ambassador Thomas Pickering ’53, formerly the US Ambassador to the United Nations, among other positions. At a State Department lunch, the group met with more recent graduates, including Mariya Ilyas ’13, who is preparing to start her first overseas posting as a foreign service officer in Jordan. They also met with Zachary Suhr ’14, a presidential management fellow in the department’s Bureau of Educational and Cultural Affairs. At a food security panel, students met with Sarah Titus ’97 and Sarah O’Flynn ’01, both program directors at Save the Children. Also present was John Bowman ’76, a senior adviser at the US AID Bureau for Food Security. In all, students met with two dozen Bowdoin graduates plus a number of other people working in the public service sector, including Judge Jeb Boasberg of the US District Court for the District of Columbia, who is the parent of a first-year Bowdoin student. Students from all academic and life backgrounds are encouraged to apply for the Bowdon Public Service Initiative. No coursework or prior policy experience is required. Most of the students on this year’s trip are double majors, and eight of them are pursuing government as a major. Other students are majoring in Africana studies, Asian studies, Hispanic studies, education, economics, math, Romance languages, psychology, and sociology, and two of the group have chosen minors in theater studies and history.